The NTSB released recommendations in its Pedestrian Safety Special Investigation Report on Sept. 25, 2018. The NTSB addressed the recommendations to the National Highway Traffic Safety Administration (NHTSA), the Centers for Disease Control and Prevention (CDC) and the Federal Highway Administration (FHA). The NTSB recommended the NHTSA revise the Federal Motor Vehicle Safety Standard 108 to include performance-based testing standards for vehicle headlight systems and to allow for adaptive headlight systems. The NHTSA was also asked to develop performance test criteria for vehicle designs aimed at reducing pedestrian injuries; to incorporate pedestrian safety systems into the New Car Assessment Program and develop new data reporting. The NTSB recommended the FHA expand support for states and communities, and develop standard definitions and methods to help states and metropolitan planning organizations collect pedestrian exposure data. The NTSB recommended the CDC work with the NHTSA to develop and implement a plan for states to combine highway crash data and injury data. The goal is to create a national database to collect pedestrian and fatality reports. Lower Speed Limits: Communities in Massachusetts have shown their concern about pedestrian safety. Many cities and towns have opted to reduce default speed limits to 25 mph, as permitted by the Massachusetts Municipal Modernization Act passed in 2016. A few communities include Boston, Quincy and Medford. 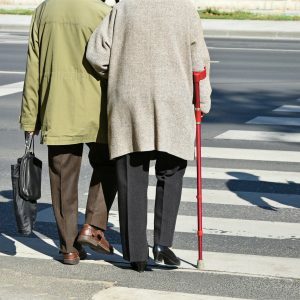 Elderly Pedestrian Fatalities: In Massachusetts, there were 234 pedestrian fatalities reported between 2014 and 2016 (Source: FARS). This data shows another vulnerability in our population; 56 of the pedestrians killed were age 70+ – or 24 percent. Our state reported the sixth highest number of elderly deaths in the U.S. (Source: Governors Highway Safety Association). Complete Streets and Safety Projects: The Governor Highway Safety Association reports Massachusetts has led a media campaign on situational awareness for drivers, pedestrians and bicyclists and that local and state police have received funding for enforcement. Another effort is the Complete Streets program, which redesigns unsafe intersections. There were 26 Complete Streets projects in 2017 and another 22 are expected in 2018. What’s Ahead: Many drivers continue to use cell phones behind the wheel and to text while driving. Texting while driving has been against the law for more than eight years in Massachusetts. Other cell phone use is permitted, but is a common cause of car accidents, especially those involving pedestrians. Many drivers think they can just “quickly” check their phones. This has never been true, regardless of the law. Pedestrians can suffer injuries or be killed in an instant. Drivers must live with their mistake and can be held liable for damages. Recreational marijuana is another danger for pedestrians. Use is now legal in Massachusetts. In 2017, the Highway Loss Data Institute reported legalization of marijuana was associated with a 3 percent increase in collision claims in Colorado, Oregon and Washington. Now it is legal in Massachusetts, six other states and the District of Columbia. During the first six months of 2017, there were a 16.4 percent increase in pedestrian fatalities compared to the first half of 2016 (Source: Governors Highway Safety Association: Pedestrian Traffic Fatalities by State – 2017 Preliminary Data). At Breakstone, White & Gluck, our Boston pedestrian accident lawyers have over 100 years combined experience representing injured pedestrians and their families. We have investigated hundreds of pedestrian crashes in Boston, Cambridge and across Massachusetts. We are here to help you and your family obtain the compensation you need following a pedestrian crash. For a free legal consultation, visit 800-379-1244 or 617-723-7676 or use our contact form.